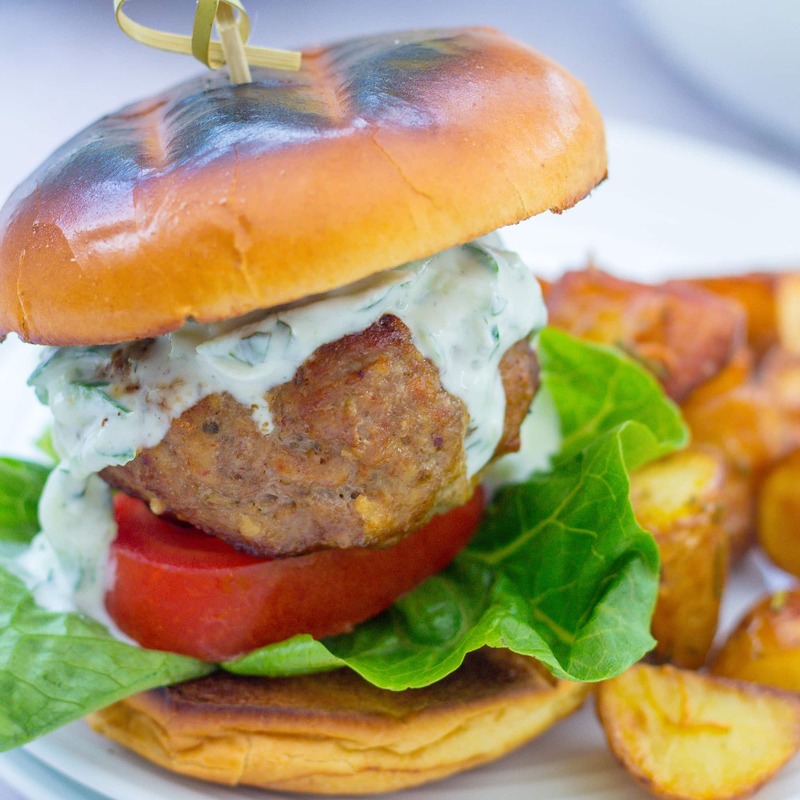 Bursting with North African spices and drizzled with Tzatziki, these Spicy Moroccan Lamb Burgers are a whole new level of burger! With so many lamb recipes on my blog, I am astonished I didn’t already have a proper lamb burger recipe on Easy Peasy Foodie. A massive omission, for which I am truly sorry ? Lamb makes such fab burgers, and goes so well with so many flavours it was tricky to decide what to make. I could have gone Greek, Mexican, classic British with some fresh mint or Italian. But in the end I decided to go Moroccan, with a delicious combo of garlic, ginger, coriander, cumin, paprika and chilli. Not one to necessarily stick with one cuisine in one dish, I then topped these fab little lamb tagine burgers with tzatziki. Although Tzatziki is officially Greek, versions of yogurt, minty and garlicky sauces are found all over the Middle East, so I figured it wasn’t too much of a stretch. And obviously those yogurt, minty, garlicky flavours go AMAZINGLY WELL with spicy lamb – a little bit of a twist on that mint sauce vibe. So what with burgers being American, mint sauce being British and brioche being French, I make that at least 5 countries represented in these burgers – I think it’s safe to call these Spicy Moroccan Lamb Burgers – ‘fusion food’!! If you have never made homemade burgers before, don’t be put off – these Spicy Moroccan Lamb Burgers are super easy to make: simply put the lamb mince (ground lamb), spices, garlic, chilli etc. in a large bowl and mix together with your hands (lots of squidging basically! ), then shape into 4 patties and grill or barbecue for 5 minutes each side, et voila. Couldn’t be simpler. I like to serve these Spicy Moroccan Lamb Burgers on a brioche bun with lettuce and tomato underneath and a good, big dollop of homemade tzatziki on the top. To be honest one of these babies is a meal in itself, but if you are feeling in need of a few extra carbs, serve with a side of potato wedges, Mexican Spiced Sweet Potato Cubes or Parmentier Potatoes. Alternatively wait until next week where I’ll be sharing my recipe for Roasted New Potatoes with Garlic and Rosemary – you won’t be sorry! Wine wise, these Spicy Moroccan Lamb Burgers pretty much go with the same type of wine that you’d serve with a Lamb tagine: Cotes di Rhone, Southern French or Spanish Grenache, Rioja, Chilean Merlot… that kind of thing. Place all the burger ingredients in a large bowl and mix together with your hands until thoroughly combined. Really give it a good squishing! Divide the mixture into 4 and roll each quarter into a large ball then squash to make a burger patty. Press a small dent in the centre of each burger to help stop the burger from rising up too much in the middle. Preheat your grill (broiler) to medium high or prepare your BBQ. Cook the burgers for 5 minutes on each side or until done to your liking. Serve in burger buns on top of lettuce and tomato and with a good dollop of tzatziki on top. If you like serve with wedges, roasted sweet potatoes or roasted new potatoes, salad and more tzatziki on the side. Nutrition information based on one lamb burger in a burger bun with 1 tablespoon of tzatziki. I am sharing this recipe with Brilliant Blog Posts, Cook Blog Share, Cook Once Eat Twice and Recipe of the Week. Oooh yummy! These lamb burgers sound amazing and so full of flavour. I would definitely enjoy them and so would the rest of the Searchingforspice family. Thanks for sharing with #CookOnceEatTwice! I just love the multi-cultural flair going on with these burgers! I often grind my own lamb, so you’ve given me the perfect recipe for using it up! Never thought to make lamb burgers (not sure why!) I adore Moroccan flavours and put it all together with a brioche bun…I’m in heaven! Wow these look super tasty. Recipe downloaded and going to cook up.